[S154] 1860 US Census, Lackawannock, Mercer, Pennsylvania. [S606] Findmypast.com, Historical Society of Pennsylvania, Deaths & Burials Image. [S107] 1880 US Census, Lackawannock, Mercer, Pennsylvania. [S364] Eben Graves, The descendants of Henry Sewall. Vol. II (Unpublished), #362. [S392] Website findagrave.com (http://www.findagrave.com/) "# 41369441." [S208] 1900 US Census, Township 3 (excl. Fresno city), Fresno, California, United States. [S205] Newspaper, Albany Morning Express, 9 March 1896. [S600] George W. Schuyler, Philip Schuyler and his family. [S392] Website findagrave.com (http://www.findagrave.com/) "# 132739543." Phoebe Millikan married Albert Glines. [S474] George Thomas Little, Genealogy of Maine, p. 600. [S365] Eben Graves, The descendants of Henry Sewall. Vol. II (Unpublished), p. 344. [S365] Eben Graves, The descendants of Henry Sewall. Vol. II (Unpublished), #121. [S392] Website findagrave.com (http://www.findagrave.com/) "# 60231947." [S232] Ancestry.com, Ontario, Canada Marriages, 1857-1924. York 1913. Helen Mills married Judge Charles Phelps Huntington in 1827. [S189] Frederick A. Virkus, Abridged Compendium of American Genealogy, Vol. 1 p. 384. [S392] Website findagrave.com (http://www.findagrave.com/) "# 115993467." [S47] James Cameron & Archer, Sarah Beatrice Cameron Crombie, The Crombies and Camerons, p. 47. [S232] Ancestry.com, Australia Marriage Index, 1788-1950. [S189] Frederick A. Virkus, Abridged Compendium of American Genealogy, Vol. 1 p. 291. James Minot was born on 31 December 1628 in Saffron-Walden, Essex.1 He married Hannah Stoughton. [S83] NEHGR, Vol. 44 p. 54. [S83] NEHGR, Vol. 14 p. 59. [S18] Various editors, Biographical Dictionary of Notable Americans, Vol. 2, p. 378. [S89] Family Search, Parish Registers, 1696-1855. Church of Scotland. Parish Church of Southdean (from christening of daughter Markie Bell). [S136] George Tancred, Rulewater, p. 190. [S89] Family Search, Parish Register transcripts, 1573-1812 Church of England. Parish Church of Berwick-upon-Tweed (Northumberland). [S89] Family Search, Parish Registers, 1696-1855. Church of Scotland. Parish Church of Southdean. [S205] Newspaper, Madras Missionary Register, 1836. [S232] Ancestry.com, London, England, Church of England Baptisms, Marriages and Burials, 1538-1812. [S205] Newspaper, The Asiatic Journal and Monthly Register, 1836, p. 109. [S105] [Bell], Bell Family Papers, Bell Papers. [S205] Newspaper, Caledonian Mercury, January 20, 1821. [S89] Family Search, Parish Registers. [S105] [Bell], Bell Family Papers, Extracts from Book of Ancrum Church Yard. [S248] Private information from Monica Horrocks, e-mail 2 July 2006. Appointed Second Lieut, in the Royal Marines, 5th Sept. 1779, and served in America and the West Indies the remainder of that war, during which time he was engaged with the enemy’s fleets in two general actions, and also one in the Magicienne frigate, under the command of the late Sir T. Graves. During the peace of 1783, he served on board several ships on home and foreign stations, and at the commencement of hostilities with France, in 1793, he embarked on board the Phoebe, which was actively employed on the coast of France; and when promoted to the rank of Capt. served in the Hector, Leviathan, and Swiftsure. He had the command of the marines of the squadron at the attack of Minorca, and was landed with a battalion under the command of Maj.-Gen. Strickland, and was at the sieges of St. Elmos and Cappowy, and at the total expulsion of the French from the King of Naples' dominions; afterwards he was appointed by Lord Keith, Maj. of the battalion, and landed to do duty in Egypt under Sir R. Abercromby: the battalion received the thanks of that officer for their conduct in the action of the 13th March. He was next ordered to embark on board H.M. ship Swiftsure, which was captured on her passage to Malta by a squadron of the enemy, under Admiral Ganthom, after a spirited resistance made by Admiral Sir B. Hallowell. 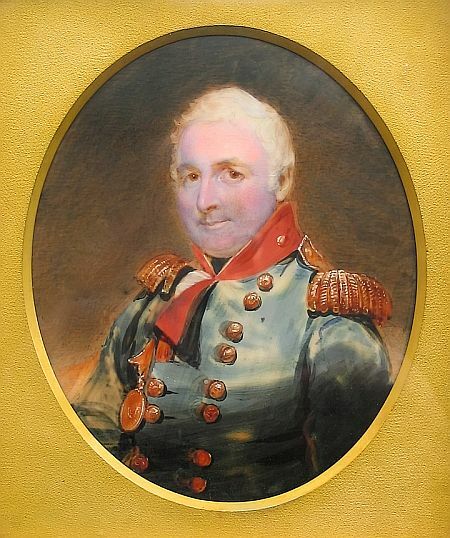 In Sept. 1804, he was selected to command the first company of the Royal Marine Artillery, and in July, 1809, the command of the four artillery companies devolved on him, and their services being approved of, they were augmented to 656, which he rendered efficient as artillery both by sea and land; and afterwards volunteered his services with the remaining brigade to Holland, where he was placed under the command of Lord Lynedock, who brigaded them with the Royal Artillery under the command of Sir George Wood. [S89] Family Search, Parish Registers for St. Giles' Church, Camberwell, 1801-1910. [S105] [Bell], Bell Family Papers, Copy of will. [S205] Newspaper, Hampshire Chronicle February 12, 1827.